Driving through mud is a cross between ice skating and walking through quicksand. Some types of mud have a greasy top layer with a hard baked surface underneath, while other types can be a bottomless quagmire of gooey mush. Different types of mud require different driving techniques, equipment and Mud Tyres. Greasy mud with a hard bottom layer is best suited to narrow mud tyres to allow them to cut through the top layer to bite the hard surface below. Wide mud tyres in this situation tend to float on the greasy top layer without reaching the hard surface underneath. Thick gooey mud tends to favor wide mud tyres as they give some flotation, similar to wide tyres favoring sand driving. Lowering your tyre pressures can help just like when sand driving, though its best not to lower tyre pressures below 20-25psi for mud. Regardless of what type of mud and what width tyres are fitted, the tread pattern needs to have large lugs to allow the tyre to 'clean' itself. If they don't, the lugs fill with mud and the tyre becomes a 'slick' with little chance of getting traction. Road orientated tread patterns tend to have closely spaced lugs to put more rubber on the road and to reduce tire noise at highway speeds. When it comes to mud, road tread tyres are at a significant disadvantage, whereas in sand they help avoid 'digging in'. 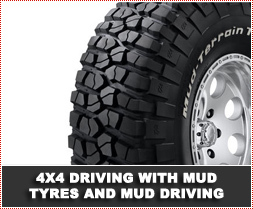 Dedicated mud tyres have large open spaced lugs to keep the tyre clean. However, they handle worse on bitumen as there is less rubber in contact with the ground and in sand they tend to dig in. Also they can have an annoying drone at highway speeds. Unlike some other types of terrain, mud-driving techniques vary on the type of mud. Reducing tire pressures can help in 'bottomless' mud whereas it can make things worse when a hard surface is below the mud. Mud usually tends to hide obstacles such as tree roots and sticks just waiting to slash your sidewalls, so its best to avoid reducing tire pressures if you can avoid it. Driving on the peaks between tyre tracks can provide firmer ground, as water tends to collect in the wheel tracks. Though sometimes the existing wheel tracks have cut through to the firmer surface underneath and provide the best traction. Moving the steering wheel left to right about 90° from the center can help the front wheels bite into the mud in search of traction. Do not turn the wheel too for as you can end up making things worse. As you have probably gathered by now, mud driving is unpredictable and you need to have a knowledge of different driving techniques to know which one to apply in each situation. What doesn't change is the need to have good mud tyres with big self-cleaning lugs and good recovery equipment. A way to overcome the cost and audible discomfort of mud tyres is to use tyre chains on your existing tires. They will dramatically improve your traction, but they do damage the track surface. It is best if they are only used when you HAVE to traverse a muddy track, as they can make it almost impassable when it dries out. If possible, it is best to let a muddy track partially dry out so you con get through in 4WD without using chains, as chains will deteriorate the track for future users. There are two main types of tyre chains, the bar (ladder) pattern or the diamond pattern. The bar pattern is better for mud as it really bites into the surface, whereas the diamond pattern is normally used for snow driving. It provides a smoother ride as the chain is in constant contact with the surface and has side-slip resistance, whereas the bar type has more of a digging action. Both types of chains can be used in either situation so if you do purchase them, choose the sort for your main type of driving. Mud, especially clay and thick mud, tends to stick wherever it touches, It can build up under the wheel arches to the point it acts as a brake on the tyres. This type of build-up is obvious and has to be cleared immediately, but other types of build-up that are not so obvious but still need immediate removal is on the rims. Even a small amount can throw your wheel balance out dramatically and can lead to uneven tyre wear and a vibrating steering wheel. Once all visible mud has been removed, its necessary to check items like diff and gearbox breathers to ensure they are clear, otherwise it can lead to seal damage in the long term. Also check all drain holes on the chassis etc to ensure they are not blocked. Its surprising how mud can even find it’s way to block drain holes on the bottom of doors!